Will the Evolution Beverage Center Fridges that you have as an option get cold enough for beer? BEST ANSWER: no it will not and actually we are having a problem getting it to cool enough for our whites. Goes down to 46 but even without the door being opened for 3 days can't get it below 49. Bottom for reds and it won't go to the lowest point either. We do like it but are somewhat disappointed in the temp ranges. Hi Sara - you can set the temperature on the refrigerator to different levels; however we store out wine around 55, which would not be cold enough for beer. For example, we often put our champagne in our normal fridge prior to drinking. We don't drink beer so I cannot answer this question for you. However I don't think you could mix the beer and wine because of the difference in temperature each requires. We keep our wine at 57 degrees. Beer usually 42 degrees in US but Europian serves are 48 to 52. It looks like 52 degrees is the highest that it will go. We'd actually like it even colder for white wine, so beer, probably not cold enough, either. Very nice fridges, though. I believe so but have not used for beer. I keep it at about 57 degrees for the wine I have in there. The manufacturer should be able to tell you. Haven't tried that, have an extra fridge for that purpose. Yes the unit will go down to 34 degrees. Do you have similar pieces in lighter wood tones? BEST ANSWER: The one I have is the mahogany tone. It is lighter and browner than the black one shown. This is a fabulous piece of furniture, VERY heavy and comes in a wooden crate that the freight company takes apart and places in your house. If you have wood floors make sure you have plenty of towels or sheets for them to slide it as it will damage your floors otherwise. Also, have some heavy duty felt pads at hand and they will stick them on for you in case you ever have to slide it. I LOVE this piece. It was expensive but very well worth the price. There is nothing cheap about it and will last a lifetime and beyond.. I have the walnut which is a medium tone, not a dark walnut. Can refrigerator get cold enough to have beer and sofa in them? 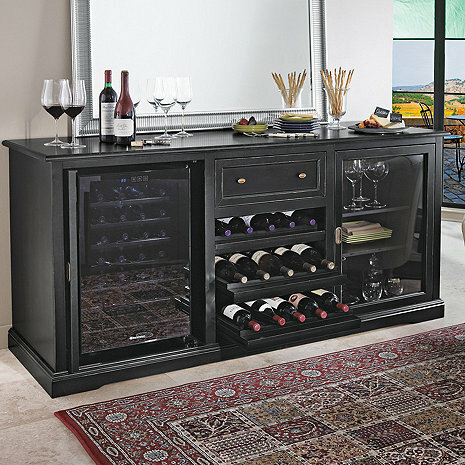 BEST ANSWER: Hi Cathy - our refrigerator is kept at 55 degrees, which is perfect for our white wine storage. I don't believe that it is cold enough for beer or soda. The refrigerator may be able to get a bit colder, but not much. As an example, we store some champagne in there, but I prefer it even colder and usually transfer the bottle to our main refrigerator prior to opening. We love this credenza though :) Hope that helps. No. Lower limit is 52. But you can purchase with one fridge and consultant can help you find a beverage fridge that would work, or just ask for dimensions and purchase a beverage fridge separately. It's a beautiful piece and easy enough to use your own fridge if you wanted. Probably not--we have the red wine drug and it only goes down to 52. The piece is quite the centerpiece of our dining area and the refrigerators keep perfect temperature.